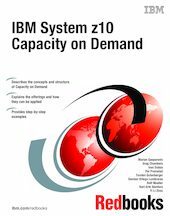 The IBM® System z10™ servers provide a base for major server consolidation by further removing memory, processor, and channel constraints. Capacity on Demand offerings provide the flexibility to absorb temporary or permanent growth, maintenance, and disaster recovery situations in an enterprise. This book is intended for systems engineers, infrastructure architects, and anyone wanting to understand Capacity on Demand functions. Readers are expected to be generally familiar with existing System z® technology and terminology.